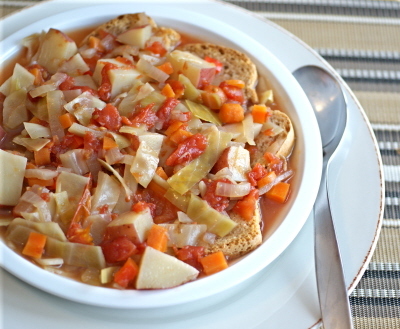 Here’s a variation of classic sweet-and-sour cabbage soup, given a bit more heft with bread cubes nestled in each serving. Preheat the oven to 300F (150C). Spread the bread cubes in a single layer on a baking sheet and bake until golden and crisp, about 12 to 15 minutes. Remove from the oven and set aside. Heat the oil in a large soup pot. Add the onions and garlic and sauté over medium heat until golden, about 10 minutes. Add the water, carrots, potatoes, cabbage, bell peppers, tomatoes, wine, paprika, and cumin. Bring to a rapid simmer, then lower the heat. Cover and simmer gently for 30 to 35 minutes, or until the vegetables are tender. Stir in the lemon juice and sugar. There should be a subtle sweet-sour balance. If you’d like it to be more pronounced, add more lemon juice and/or sugar to your liking. Season with salt and pepper, then simmer over very low heat for 10 minutes longer. If time allows, let the stew stand off the heat for an hour or two, then heat through before serving. When ready to serve, divide the bread cubes among the serving bowls and ladle the stew over them. 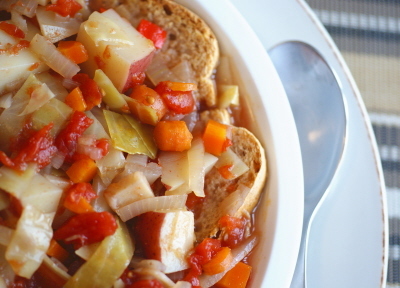 The bread will absorb much of the liquid and add a tasty, textural element to the stew. NOTE: For an ACD-Friendly version (Stage 2 and beyond), use whole-grain, gluten-free bread, and replace wine with unsweetened cranberry juice; replace agave with 10 drops stevia, or more, to taste. I love Nava’s soup cookbook. Any soup you make from it will be fantastic. The Almond-Brussels sprouts intrigues me! Hey cabbage soup twin! (smile) I love the nest of bread cubes. I’m pretty sure I could amp my bread to soup ratio that way! I hate the snowy season too. In fact, my mom just brought up the idea of flying to NYC for te weekend next week and I said, “Can we go in May instead?” I never thought I’d turn down NYC… but if I’m going to pay the money to go, I’d much rather walk around in the warmth than cold, snowy ugliness! I spent a childhood longing to see snow so I still have a sneaking desire for the stuff even though I now know it is very cold and inconvenient – but I still prefer it over a heatwave! And an excuse to make more soup is always a good thing! Am glad Nava’s new soup book is out as it has reminded me I need to make more from her old cookbook that I own – it does have lots of excellent ideas but I am a little unsure about sweet and sour with bread – sounds like it should be with rice or noodles. However I would be willing to give it a try! Yeah, I’ve never quite been carefree either. Ugh. I do love soup, though! I’m so sick of this gross weather!!! But that soup looks amazing…one of my favorite ways to enjoy soup is with bread dipped in. YUM! LOL i love your posts – they are always so witty and funny! I have to admit – if I were flipping through the cookbook, this is not a recipe I would have bookmarked. Your willingness to vouch for it, however, makes me want to give it a try 😀 Your photos make it look delicious! I totally agree–winter in Toronto can be gross. Especially today: it’s freezing! But this weekend is going to be good and warm so don’t fret. And at least we have delicious chunky soups like this one to last us the winter. I’m impressed with the calorie vs fibre totals for this recipe. 6 g of fibre for 230 cals are quite good numbers. I hate this weather too – hang in there!! I really love snow, I wish we had more of it. I can come and shovel some snow for you! That cookbook sounds mighty interesting. I always enjoy a nice soup recipe, and this sounds wonderful. I’m with you on this weather, I can’t wait for Summer to get here! Your first line had me in stitches! February is the most evil month, but once we get through it it’s so much easier to deal with! i thought i was the only one who hated snow. seriously when it starts coming down i get so mad… i hate it!!! the only time i can tolerate it is if i can stay in my pj’s all day and watch movies. Ricki, I love you. Really. I was just confessing to my mom that the only time I eat cabbage is in stir-fry at Thai restaurants (and how ashamed I was about neglecting such a wonderful veggie…) I knew it would be prefect in a soup but wasn’t sure how to work with it or what you add to it… now you’ve posted this and I’m in heaven. Ooh that’s a really interesting recipe! I do not use enough cabbage in my cooking! Soups are my recent favorite thing to cook. Thanks for the idea. We got yet another snowstorm yesterday! My driveway is one big sheet of ice. 11 “snow events” this season so far – that is a ton for us here on Long Island. I love that book – I have the original and the vegan version. I have been making the foccacia recipe for years and years! Yum. I’ve never had sweet and sour cabbage but this dish looks so compelling. I love the idea of bread cubes nestled in. How comforting! Yuuuuuuum. I was trying to figure out what to do with the cabbage sitting in my fridge! I am also sick and tired of this winter!! The soup looks great. I have the older version of this book.. I love that it’s divided by seasons..
Soup is my favorite food I think. Soup with cabbage is delish! and courtship beside a stockpot sounds reasonable to me. oooh my gosh – this soup looks glorious, Ricki! i’m going to have to make this soon! it’s warming me up just looking at it! while you’re not a snowy weather person – i’m not a summer person. i just can’t take the heat! aahhahhhaaa! seems like most people love warmer weather – i think the only thing i love about it is that i get to wear flip flops! There is nothing more soothing than soup. I have cabbage that I intend to use for soup but I’m trying to work up the motivation to do all that chopping! OH WOW. that sounds amazing. i am totally making this on sunday. i love cabbage! this sounds really intriguing–glad i’ve come around to cabbage!! i feel your pain about the winter!! This soup definitely looks warming and cozy. I try to surround myself with citrus to make the winter seem a little bit less gloomy… I think it’s working so far! Bundles of meyer lemons and blood oranges do wonders for one’s mood. I can’t believe what a comeback cabbage has made. I’m sure it’s the new power food. Leave off the sugar and swap vinegar for the lemon juice and this could be my cabbage soup. I always use vegetable soups as a way to detox from the holidays but then I’m stuck with cold gloomy February and I’m sick of soup. I guess I should check out the book for more ideas. The stew looks delicious! I love the idea of a cookbook with recipes divided by season! Very cool. Ditto on the winter sentiments. Soup is definitely my favorite food this week, anyway! Yes, wouldn’t that be nice? At least I haven’t grown that far away psychologically, anyway!! The soup looks really good! I think I want to get this book! This soup looks amazing and that book sounds so interesting. I love creative soups. This one looks rich and hearty without being heavy. I’ll have to try it. I’ve been dreaming of a nice soup involving bread, so once again, Ricki, you have perfect timing. Thanks soooo so much for your honesty, Ricki. I’m seriously going to consider changing my blog background. It might be a while before I change (because I’m lazy and never seem to get around to things like that!) but I’m pretty sure I’m going to. I’ve been making soups more often recently but I rarely come across a soup recipe I really love. I don’t know if it’s me being picky about soup, or if it’s that I’m not finding the right recipes. I do really love making soup (and vegetable stock) though. Very relaxing. And wow good for you for how you used to spend Friday cooking meals for the week. I said we would do that on Sundays (or at least cook 1 or 2 extra things) but we haven’t been doing that.